Last week, Dr. Cheerlubber presented a lovely song by Strange Talk called “Eskimo Boy”, which is why I thought a good response to that was to bring about the even peppy, catchier, and entrancingly fun “Skeleton Boy” (that and also Halloween is RIGHT around the corner!). 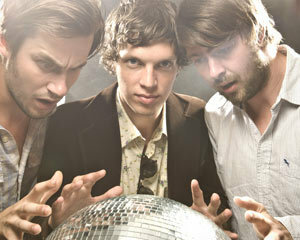 Friendly Fires, direct from the UK, love to make danceable songs. In this video, you’ll seem them jam out while their skeletons start to fill in. I think it’s rather a simple and yet creative play on the song title. Favorite part of the video: 1:43, the singer has the most hip dance moves I’ve ever seen on a white guy. With that, hope this tune gets you moving and beware of dancing skeletons, they’re not always as cute as these blokes. Enjoy! !